Knowing all the Rules of Golf is tough enough; playing by all of them can be just plain cruel. In a perfect world, we would all play golf completely by the Rules. All of them. All the time. Every time. However, in my experience, outside of tournament play, very rarely do I find that golfers follow every rule, every time, myself included. I don’t throw this generalization out for consumption to impugn the integrity of all golfers as a class of cheaters. For the casual golfer, in most cases of loose adherence to the Rules of Golf, I suspect that expediency or local custom lie at the root of noncompliance. For years, unless a wager of sufficient size was involved, I played with a group of guys that played all water hazards and out-of-bounds as lateral hazards. None of us kept an official handicap, and the idea of losing additional golf balls or precious moments of fleeting daylight seemed like an unnecessary waste (if we couldn’t hit the shot the first time, there was no guarantee we could do it the second try either). 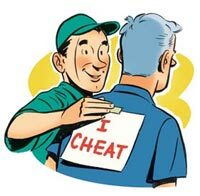 I don’t know how much deliberate, nefarious cheating actually occurs on the golf course. The little socially acceptable rules infringements that have become common even have names that make them more palatable. Mulligan. Breakfast ball. Lunch ball. Sure, there are golfers among us that might occasionally foot-wedge that ball from behind the tree. And “Lift, clean, and cheat” is incredibly tempting even on the second day after it’s rained if the course is still soggy. But I would suspect that most rules violations aren’t even acknowledged, and may even be understood and accepted (a violation of Rule 1-3 in and of itself) amongst friends and golfers. One of my favorites is the 30-second shot clock that I think Jim or Brian mentioned last year: When you top your tee shot, if you can retrieve it and re-tee it within 30 seconds, it never happened. Clearly not allowable under the Rules of Golf, but a helluva a lot more fun than trying to play out the hole from the downslope of the tee box in front of you. He who has the fastest cart never has the worst lie. I don’t want to admit it, but my handicap may include rounds in which absolute conformity with the Rules was…well…casual. 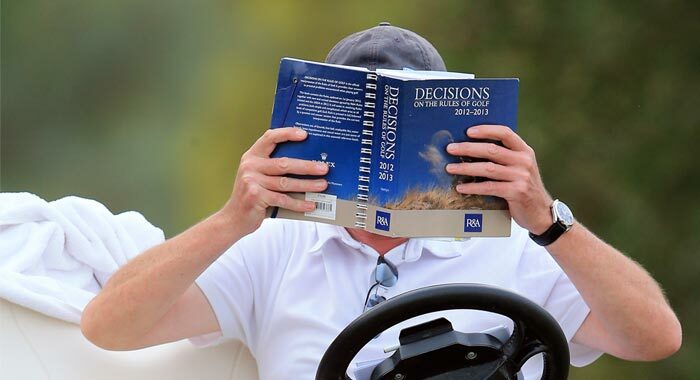 So for the May Question of the Month, I put it to you, Dear Readers: what Rule of Golf do you most frequently or regularly violate (outside of tournament play, of course) in your regular golf game? ← March Question of the Month: What’s the longest iron you carry? Dave, never heard of that 30-sec shot clock but like it! I suppose the rule my group slides on is the lost ball (play it like a lateral) only to save time. Especially helpful when walking and not having to return to the original shot and play another ball. What would be a really interesting and somewhat dicey topic to explore would be how you handle a situation when you catch someone cheating. Be it a friend, business partner, competitor, etc. I think the stroke and distance penalty should be eliminated, but that’s just me. Also, we usually will give free relief if your ball is on rocks or a root. Clubs and wrists are too expensive! Besides out of bounds as a lateral hazard, nobody hits from a divot. 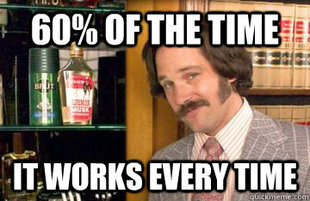 Otherwise we always play it down. Lost ball is also dropped in area. Roots are also an exception.